Mircrochip has a new USB to Serial converter available called the MCP2200. [Sjaak] suspected that it may have been made from an existing 20-pin PIC and found that reading the device signature with the PICKIT3 shows that the chip is an 18F14K50. Most likely this is running Microchip’s USB stack but it’s hard to tell because chip is code-protected, reading back all zeros. So he set out to write some replacement firmware which would provide the same functionality and give you access to the rest of the chip’s features. There were some speed bumps along the way. The first one is that Microchip’s licensing for their USB stack won’t allow you to open source your firmware. That’s okay, it seems there is already a USB stack that can be ported which doesn’t have this restriction. The second wrinkle in the plan is that [Sjaak’s] code doesn’t come with a VID/PID pair that you can use like V-USB does for AVR chips. But that doesn’t diminish the accomplishment of getting the device to work by echoing back characters it receives. Full USB to serial support with the replacement firmware is on the way. If this is meant for a model rocket it must be the biggest we’ve ever seen. [Scott] and [Trevor] took on the task of building a rocket attitude control system after reading about some research on the topic. But that researcher only tested the theories using simulations so they set out to build their own. The prototype above has a tank of compressed Nitrogen which can hold up to 3000 PSI. You can begin to understand why this needs to be used with a big rocket. The pressurized gas is connected through a regulator to four valves which feed nozzles around the circumference of the fuselage. 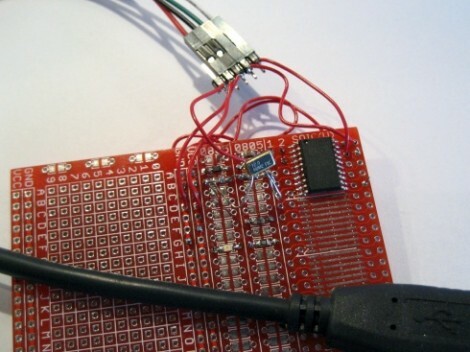 An Arduino takes readings from a gyroscope and actuates the gas valves via a relay board. You can check out the test rig in the video after the break. The prototype is suspended horizontally from a wire and its orientation held at one position by the system. There’s also a paper (PDF) if you’re interested in the equations that went into the stabilization control. This system would have been right at home on that huge sugar rocket we saw back in October. [Tech B.] 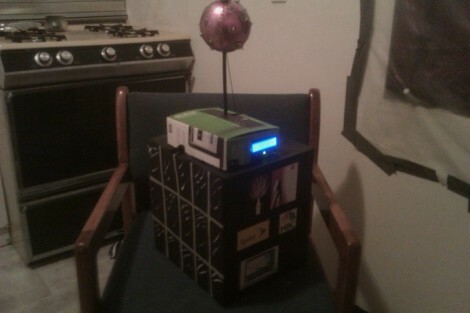 hacked together a Ball Drop for New Year’s Eve using stuff he had lying around. The ball itself is an old Christmas ornament that he cut in half and filled with 14 LEDs and a 9V battery. He finished up that portion of the project by gluing the halves back together and adding a hole for the guide rod. 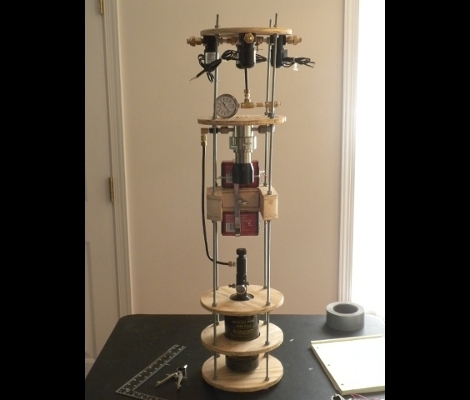 The base is made of some cardboard boxes and hides an Arduino, a servo motor, an LCD screen, and the base for the vertical rod. When the last ten seconds of the year are counted down, a servo lowers the ball by unspooling some yarn that loops over the top of the rod. As the yarn is slowly dished out gravity pulls the ball toward its goal. We’ve embedded [Tech B.’s] demonstration video after the break. Here’s a simple and interesting idea that increases the visual persistence of a laser scanner image. Using glow-in-the-dark paint, [Daito Manabe] prepares a surface so that the intense light of a laser leaves a trace that fades slowly over time. He’s using the idea to print monochromatic images onto the treated surface, starting with the darkest areas and ending with the lightest. The effect is quite interesting, as the image starts out seeming quite abstract but reveals its self with more detail over time. As evidenced in the test videos, the bursts of laser scanning are matched to the fade rate of the paint. Therefore it would seem that the time taken to “write” an image is directly proportional to the desired visual persistence of the final image. We wonder, by combining clever timing and variable laser intensity could you write images much more quickly? How hard would it be to use this for moving pictures? With the ability to create your own tiny laser projector, and even an RGB scanner, there must be a lot of potential in this idea for mind-blowing visual effects. Add portability by using a phosphor-treated projection screen! Share your ideas and check out the test videos after the break. The Lunchtime clock is a hacked clock that pulls a sneaky little trick to get you a longer lunch. In this instructible, [Randofo] shows us how he uses an Atmega168 and a realtime clock kit from Adafruit to slow the clock down 20% starting at 11:00 and then speed it back up at 11:45, gaining you an extra 12 minutes of sweet delicious lunch. Not really sure how noticeable this would be? Check out the video after the break. This is pretty hilarious and we can actually think of a few offices where this might work. However, many offices rely on their main network server for actual time keeping leaving this as just an amusing novelty. Still, those with luddite bosses can rejoice in your new-found extended lunch. Custom displays are a lot of fun to look at, but this one is something we’d expect to see at a trade show and not on someone’s kitchen table. 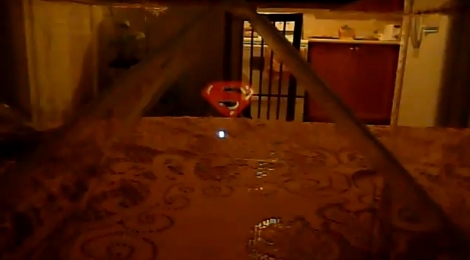 [Taha Bintahir] built a 3D volumetric display and is showing it off in the image above using a 3DS file of the Superman logo exported from Autodesk. In the video after the break you can see that the display is a transparent pyramid which allows a viewer to see the 3D object inside from any viewpoint around the display. Since first posting about it he has also added a Kinect to the mix, allowing a user to control the 3D object with body movements. There’s basically no information about the display hardware on [Taha’s] post so we asked him about it. It works by first taking a 3D model and rendering it from four different camera angles. He’s using a custom designed prism for he display and the initial renderings are distorted to match that prism’s dimension. Those renderings are projected on the prism to give the illusion of a 3D object floating at its center. We’re hoping to hear more details about how this was designed and what hardware is being used. We’ll post a follow-up if [Taha] shares more information.